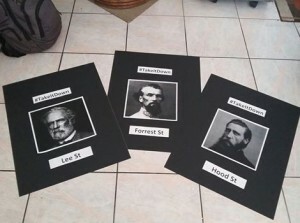 Activists involved with the Black Lives Matter Alliance have been campaigning for several months to take down the street signs named after Confederate war generals in Hollywood. 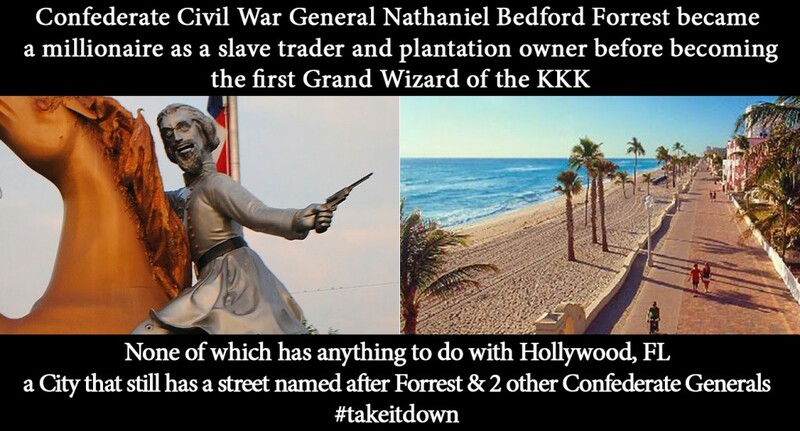 Take Down Slavery Symbols in Hollywood Campaign invites the public to once again pack the Hollywood City Commission this Wednesday. We call for ending official support for symbols of slavery in our cities. They pay tribute to systemic racism that cannot be tolerated. Given the plague of problems we continue to face today with the proverbial evil of the nation, the color line, we call on the people of Hollywood and South Florida to join us at the City Commission and demand these ludicrous names be replaced. Activists will meet at the Hollywood Public Library to prepare starting at 1pm. To speak on the issue, please arrive by 4:30-5pm. You will need to fill out a speaking card. Great post. I was checking constantly this blog and I’m impressed! Very useful info specifically the last part I care for such info a lot. I was looking for this certain information for a long time. Thank you and good luck.